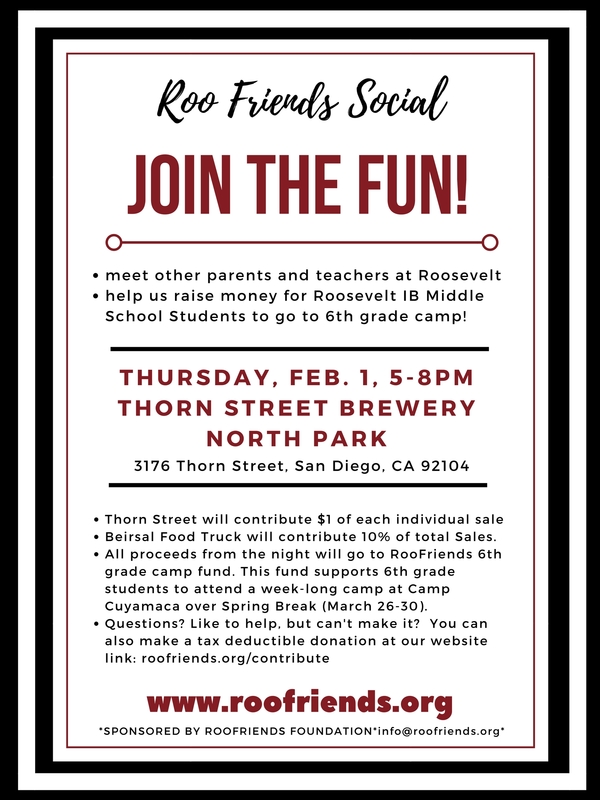 Join the fun at this family-friendly event and help raise money for Roosevelt Middle School 6th Grade Camp scholarships! Thorn Street Brewery has generously offered to contribute $1 from each individual sale and Biersal Food Truck will contribute 10% of their total sales during the event. All proceeds from the night will go to RooFriends 6th Grade Camp Fund. This fund supports 6th grade students to attend a week long camp at Camp Cuyamaca this Spring. Visit www.roofriends.org for more information about RooFriends and 6th Grade Camp. Questions? Like to help, but can’t make it? You can also make a tax deductible donation at roofriends.org/contribute. If you’d like to help with this event, please email info@roofriends.org. See Flyer. . Event sponsored by the Friends of Roosevelt Foundation.